Wow. This is exciting. After a lot of inspiration over the last 4 months, I shall right now share with you my first original thought-leading work in the field of strategy and business. I'm excited for both of us. For me, there's the prestige, the book publishing deal, the subsequent book award ceremonies, the book signing events, the inevitable speaking circuit, the honorary degrees, the Time magazine cover, and the whispers of certain Swedish prize named after a certain Swedish Alfred. And for you? There's the thrill of having the inside scoop on the next generation, nay, Paradigm, of thought. You'll recognise this thrill if you happened to read The Life of Pi before it was a movie. Or if you had a beard prior to 2011. Or if you liked Mark Ronson before Uptown Funk. Or if you still like Radiohead. You're ahead of the curve. You have Cultural Capital. "You're smart, and you have a keen eye. But we're not in engineering school anymore, buddy. If you're issue has more than two parameters, you're just not doing it right." Let me explain via the BCG Matrix, one of the most traditional 2x2's (yes, they can be abbreviated thus). If we're entering unfamiliar waters now, Wikipedia or your local MBA-administering institute of higher education can help. With the BCG Matrix we find Relative Market Share on the x-axis (horizontal), and Market Growth on the y-axis (vertical). Two parameters. A 2 x 2 matrix. A perfect fit for the Kitto Model. 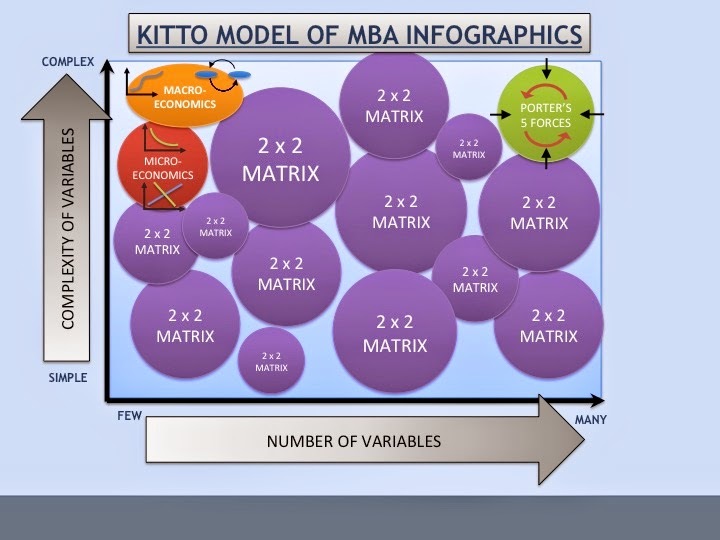 But what is the BCG Matrix really considering? Let's dig deeper. Now occasionally the 2 x 2 can break down. Luckily, in these instances we have the line graphs of Micro- and Macro-economics to fall back onto. And if we're really stuck, Porter's 5 Forces can at least provide a credible framework from which to admit defeat. So there you have it. See you on the other side of fame. Just wanted to say, great work. As a fellow MBA back in old blighty (Brisbane), I know only too well about the 2x2. As a cultural learning, I have something else to share. Our marketing lecturer was from across the pond (NYC) and all of his 2x2's had the high levels opposite to the UK/Aussie versions. Namely, y-axis high was on the bottom, x-axis high was on the left! So, that was a huge eye opener for me (and I mean literally. I was falling asleep until that came up). Anyway, great work and hope to see another similar instalment soon. Happy Easter.